Oh, the bureaucracy and taxes of Italia merit the writing of a Second Lamentations, but her kitchen is exceptional! Mix together the freshest produce and pasta, add steam and spices, and you have a savory soup that doubles as a vibrant metaphor for the family of God. To explore the metaphor, look at the definitions of the word here below (especially the bottom line of each picture). 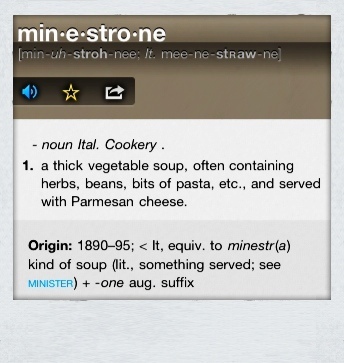 As you can see, the Italian word minestrone has its roots in the word “minister“; to furnish or supply a need. 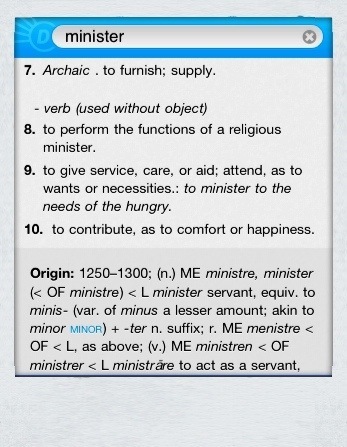 The verb form ministrare simply means to serve. 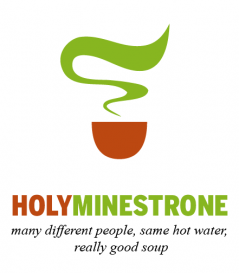 The soup form of the word, therefore, pictures all kinds of different “ministries” along with the people that find themselves in the same hot water of Christian community.Extending the metaphor, it is the mixof the ingredients together that makes the minestrone. Combining both the people and the graces into the kettle of God’s family makes the wonderful, holy aroma of biblical community. And when you catch a whiff of that perfume, it tells you that the Father is at home with these people and that he is cooking up something good.Now, it is my contention that the church needs to recover its sense of how to cook. In other words, we often don’t taste authentic minestra because we don’t stay together long enough when the water gets hot. And, we want beans that look just like us too. So, this blog will be sharing tastes of Gospel living and serving up bowls of Christian community. Join me at the table for some appetizers to the coming family feast in the Kingdom of God. We have many tastes and delights to discover. I can smell it already. Hi, is there a group next to Pordenone? May I have a contact?